Learn how to use Projects to track project income, expenses, and profitability. This is available for QuickBooks Online Plus, Advanced, and Accountant. The Projects feature helps you stay organized and track all the moving parts. You can add project income and expenses, tag old transactions to new projects, and run project-specific reports from a single dashboard. This makes it easy to manage your work and see your progress. If you haven’t already, turn on the Projects feature. Select the Gear icon from any page, then select Accounts and Settings. Find the Projects section. Select it to expand it. Select the Organize all job-related activity in one place box. Select Save. Then close your settings. The Projects menu now appears in the main navigation bar. Select Add your first project. Give your project a memorable name. Select the customer you’re working for from the drop-down menu. Add any notes or details about the project. You’ll see your list of projects grow as your business takes on more work. Now that you’ve created your first project, start adding income and expenses. Adding transactions to projects won’t change how they’re categorized or affect your accounts. You’re simply tagging them so you can track specific project income and expenses. Select the Add to project button to create a brand new transaction. Select Estimate, Invoice, Expense, Bill, Purchase Order, or Time. The Time option lets you record a single day of work by one of your workers. If you want to add weekly timesheets to a project, there are a few extra steps. Start from Step 5 of “Track income, costs, and profitability by project” to calculate your hourly time costs. Then add your timesheets. 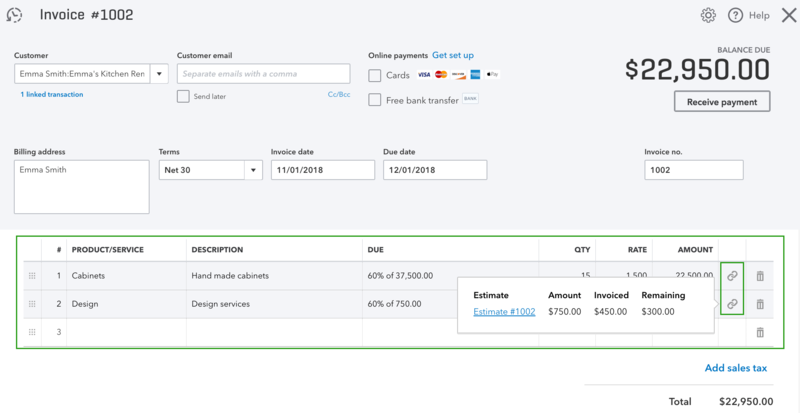 Add estimates to projects before converting them to invoices for your customer. You can also use progress invoicing to create multiple invoices from a single estimate. That way, instead of asking for full payment at the beginning, you can invoice for partial payments throughout the project. This is a good option if you’re charging customers for a fixed fee. You can also tag expenses and timesheets (billable or non-billable) you’ve created outside of the Projects menu. Select the project from the Customer/Project drop-down menu. Do this for each expense item you want to tag. This isn’t the same as the payee for the expense. Select the Type column to sort the list. Find and open the timesheet. Select the project from the Choose a customer or project drop-down menu. Do this for each employee’s time you want to tag. You can easily create new invoices for a project, but take extra care adding existing invoices. The best time to add existing invoices to projects is before they’re paid. If you add a paid invoice to a project, the invoice will disconnect from the attached payment. This will also change the invoice’s status to unpaid. You’ll need to follow the steps to reconnect the payment to avoid accidentally charging customers twice. We don’t recommend adding invoices linked to more than one other transaction, billable expense, or timesheet. If you add a linked invoice to a project, only the invoice is added. You’ll need to add the linked transactions to the project and reconnect them to the invoice. You can add existing estimates to projects as long as you haven’t converted them to invoices. You’ll see important cost and profitability info (“job costing”) on each project page.